Home / Income Tax / How to Verify Your Income Tax Return for AY 2018-19? How to Verify Your Income Tax Return for AY 2018-19? Income Tax Department provide feature to verify your income tax return through some very easy options like Net Banking, Aadhar OTP, EVC Verfication, Demat Verification, or Bank ATM Verification for Individual Assessee. For Company, Firm, Tax Audit Verification of Income Tax return is mandatory through Digital Signature and for use of digital signature you must need to register DSC on Income Tax Portal. After filing of your income tax returns, you need to get your ITR-V (return filing acknowledgement) verified. Earlier, It was mandatory to send the physical copy to CPC Income Tax Department bangalore with in 120 days. Here we discuss 5 methods from taxpayers can easily e-verify their income tax return. 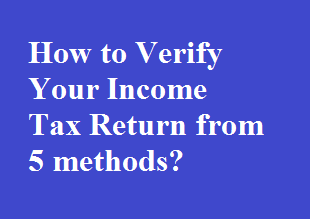 After filing of your income tax return, you need to Login your bank account and navigate to option E-Verify Return. 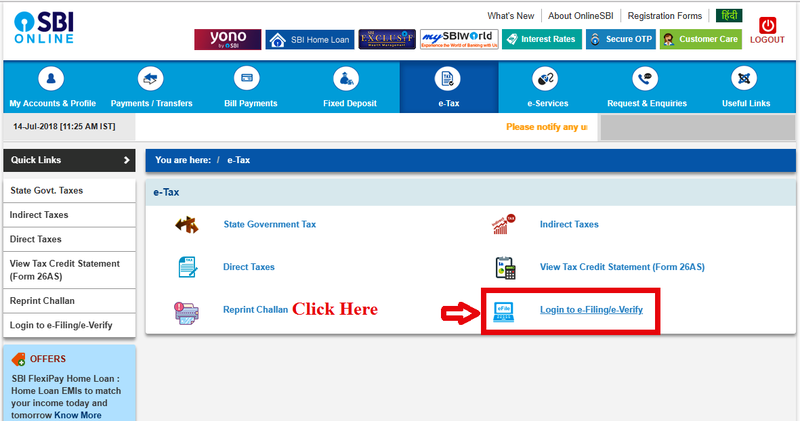 You need to find the option in your net banking, for State bank of India user can navigate to E-Tax tab and click on Login E-verify / e-verify (see below image). Click on E-Verify and login to income tax department, system will automatically verify your return, one thing is very important to verify your return with bank account i.e. your PAN must link properly with your bank account. Second you can verify your income tax return with Aadhar OTP. To verify return you must link your aadhar to PAN (income tax account), after successful linking of PAN with Aadhar you will able to verify your income tax return with OTP (Your mobile number should also link with your aadhar otherwise it wont work). After file your return go to My Account - View E-File Return/ Forms - Select Income Tax Return from drop down menu and submit. There is an option to verify pending returns for E-Verification, click on link and select verify through Aadhar OTP. You will receive a text message from income tax department having OTP to file your return. OTP valid only for 10 minutes. Enter OTP and click on Submit. After completing e-verification method, you can download the acknowledgement. To E-verify your returns from E-Filing website you need to meet certain criteria i.e. income should be less than Rs. 5 Lacs and you do not claim refund in your return. To use this method, direct login to income tax portal, after login, click on E-Verify and the EVC sent to your registered email and mobile number. Use this EVC to complete the e-filing process. It is recommended to use other method for e-verification if you dont meet the set criteria or you are unsuccessful to complete the process. Some banks are registered with Income Tax Department for providing e-verification facility. So Check with your bank before proceeding. EVC can be generated by swiping your ATM card in your Bank ATM and by selecting an option of PIN for E-Filing. Then EVC will be received on your registered mobile number which can be used to verify income tax return on government portal. 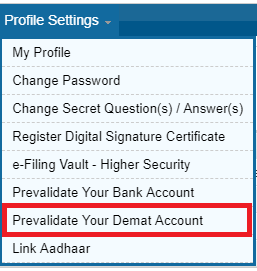 To use this option, you must update your details with your depository, then select profile setting on portal and pre-validate your demat account. Choose verification mode as EVC using a demat account and you will received EVC on your registered mobile number. Enter this EVC on e-filing portal to complete the verification. Is this safe to do verification from Aadhar OTP? Events in Chandigarh .